The Block II Army Tactical Missile System for the Army was a long range, all weather, day/night, tactical missile designed to defeat critical high pay-off targets in support of Corps level deep operations. The Block II variant was a pre-planned product improvement (P3I) to the Army TACMS Block I and IA missile systems specifically designed to kill moving armored targets and surface-to-surface missile (SSM) transporter erector launchers (SCUD TELs). 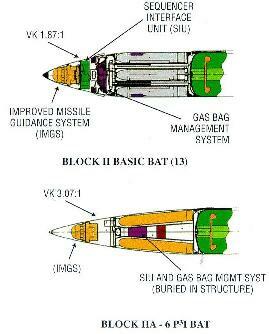 The Block II carries 13 BAT or P3I BAT brilliant submunitions. The Block II carrying the basic BAT was designed to destroy critical moving armored formations such as a reserve tank battalion moving from assembly areas in the enemy's rear. The Block II equipped with P3I was designed to seek out and destroy both stationary targets, such as the SCUD and moving TELs and tanks as well. As with the Block IA missile, the Block II guidance set was augmented by an on-board GPS to improve accuracy. Army TACMS Block II is a conventional semi-ballistic surface-to-surface designed to attack targets beyond the range of existing field artillery cannon and rocket fires. The missile is fired from the launcher assigned to MLRS Corps Artillery Unit. There is 1 missile per guided missile and launching assembly and 2 missiles per launcher load. The Block II utilizes the Block I missile control and propulsion set, the Block IA guidance and inertial navigation set, and unique hardware and software to assure necessary missile communication with the BAT and P3I BAT submunition. Thrust for the missile is provided by a solid propellant rocket motor which is ignited by an igniter arm/fire device. Control of the missile during flight is accomplished by four fins located 90' apart in the control section of the missile.